The new 5.5-litre twin turbo V8 from Mercedes-Benz has been confirmed and will make its debut in the S 63 AMG this coming summer. 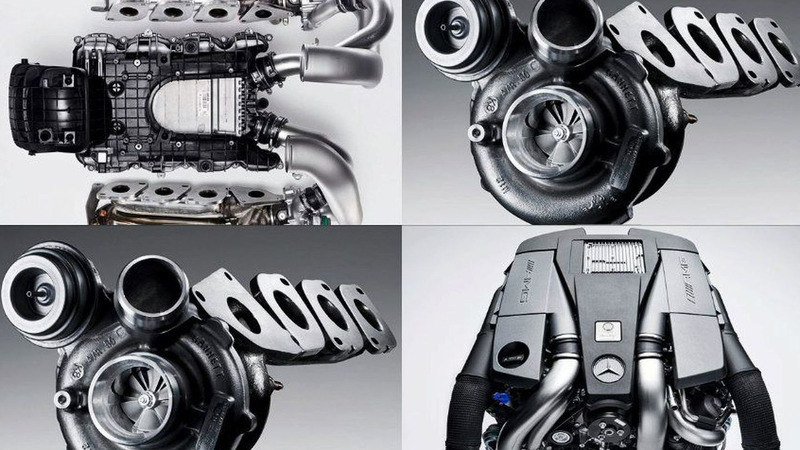 Mercedes-Benz has released details regarding its new lightweight 5.5-litre twin turbo V8 engine. The engine was speculated upon late last year and now is confirmed as reality. It will be used in certain AMG models, the first being the S 63 AMG from this summer. The new 5.5-litre, codenamed the M157, replaces the current 6.3-litre (6208cc) naturally aspirated V8 which has been doing duty in cars like the C 63 AMG, the CLS 63 AMG, the E 63 AMG, the S 63 AMG and the CL 63 AMG. Power is rated at 400kW (544 PS / 536 bhp) at 5,500rpm and peak torque is a massive 800Nm (590 lb-ft) made between 2,000rpm and 4,500rpm. An even more powerful version with the AMG Performance Package of the 204kg engine will produce 420kW (571 PS / 563 bhp) and 900Nm (664 lb-ft) of torque. Both will be mated to Merc's 7-speed MCT transmission which helps the less powerful model achieve 26.9mpg (UK) in average fuel consumption. According to Autocar, a smaller 4.6-litre version of the engine, also sporting two turbos, will be used for the new CLS and S-Class derivatives later this year. Hi-res photos will be added later. See press release below for full details.